Tic Tac Toe Deluxe is developed by Random Salad Games for Windows 8 and 8.1 that is available for free in Windows store. The game is based on the most famous classic game of tic tac toe. 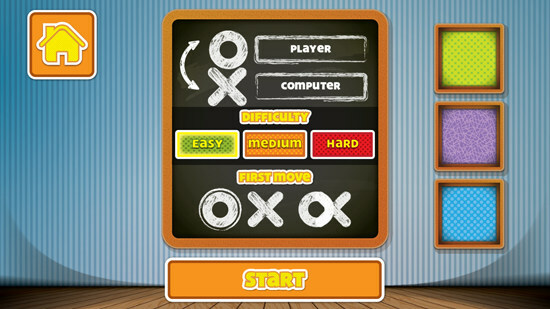 Tic Tac Toe Deluxe has two game modes, one player and two player. In one player, you play against the computer. You can choose on the next menu if you want to have X as your piece or O. You can also change your name in the game. There are three difficulty levels namely easy, medium and hard. The game also lets you decide whose turn will it be when the game starts. In two player game mode, there are no difficulty levels and you cannot change whose turn will it be when the game starts. After defining the game modes, you can click on start to start playing the game. When a new game of Tic Tac Toe Deluxe starts, there are two boxes on the left side that keep a track of which player won how many times. It helps in knowing how good or bad you are playing. There is no timer in the game, so you can play it for as much time as you want. Also check out our featured article on Tic Tac Toe game apps for Windows 8. Tic Tac Toe Deluxe has really nice graphics and colors. The graphics of the game make it look like a game designed for kids but it is more than a game meant just for kids. It has good sound that adds an extra element to the quality laid out to enhance Tic Tac Toe Deluxe. The game is absolutely free and can become an addiction if you love playing this game. The game comes with three beautifully designed themes that you can change from the settings menu which can be toggled by clicking on the gear icon on the bottom of the game. Download Tic Tac Toe Deluxe.